Unit 1 revolved around some of the basic verb tenses of Turkish, and Unit 2 will deal with other common verb tenses that are more difficult for English speakers to grasp. We will start with what is commonly referred to as the aorist tense, a tense that has no easy equivalent in English. We have already seen many verbs in the aorist tense in these lessons, and so you probably already recognize it. Usually, it takes a variation of the -ir ending as in "kalır (from kalmak)", "unutur (from unutmak)", "gelir (from gelmek)" and so forth. For verbs with a single-syllable root, this ending is usually either -er or -ar in the aorist. These include "çalar (from çalmak)", "döner (from dönmek)", "gider (from gitmek)" and many others. However, there are a number of verbs that take the -ir ending instead that should be memorized. Finally, verb stems that end in a vowel simple receive an -r suffix, such as "anlar (from anlamak)" and "ağlar (from ağlamak)". That is the easy part, but the hard part is deciphering the tense's various meanings. Before explaining these meanings, I'll introduce this lesson's song, "Karaköy" by Ezginin Günlüğü. This band has been active with different groups of members since the 1980s and rose to popularity during the latter half of the 1990s. The song, "Karaköy", from their 2002 album entitled Her Şey Yolunda, is typical of their reflective or sometimes poetic lyrics. It delves into the issues of nostalgia, regret, bitterness, and memory embedded in the lived geography of Istanbul. 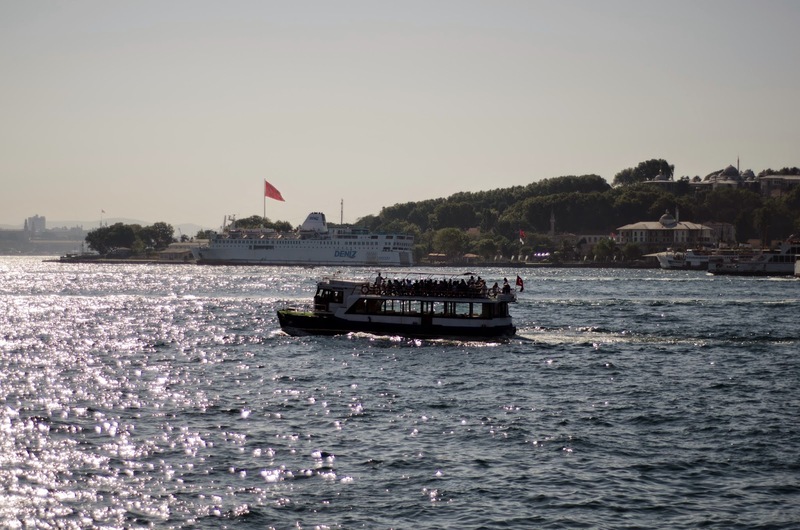 In particular, the song (written by Nadir Göktürk) describes the feeling of reminiscing upon a failed romance while sitting in Karaköy and watching the boats that shuffle passengers back and forth across the Bosphorus between places such as Kadıköy. This scene, in addition to being one that virtually everyone who has been in love in Istanbul has experienced, provides an ideal window onto the meaning of the aorist tense. It is in fact debatable whether or not the -ir ending in question is really an aorist at all. The reason why the word is used is because its meaning is "unmarked" as in aorist tenses of other languages such as Greek. More plainly, what the tense refers to is an action the temporality of which is ambiguous. Sometimes it is the present, sometimes the future, sometimes it carries the connotations of "would". Therefore, we cannot understand it in isolation but rather in terms of points of distinction between other forms of the present and future tenses. In this song, the first line is "Karaköy'de vapurlar, biri gider, biri gelir" meaning "In Karaköy, one boat goes, another comes." If we take the verb "gider" meaning "goes", we can compare it with the verb "gidiyor" meaning "goes/is going" to show that while "gidiyor" refers to one specific time, "gider" is more broad or repeated. In other words, he is not saying "one boat is leaving and another is coming" but rather he is describing the continuous arrival and departure of boat traffic. This use of the aorist to refer to general or habitual actions is one of its most common. However, in the very next line we have another usage. He says, "cebimde eski bir hikaye, açsam kirlenir" or "there is an old story in my pocket, if I open (it), it will get dirty". Leaving aside the exact meaning, we can see how here the aorist has the meaning of future or the sense of "would". This is the common meaning when used with the conditional ending -se (discussed in the next lesson). We infer here that "kirlenir" does not mean "it gets dirty (repeatedly)" but rather "it would get dirty". This is different than a verb with the -ecek ending in that while "kirlenecek" means "it will get dirty (certainly)", "kirlenir" implies that it would get dirty under some certain conditions. In the song lyrics below, I have placed each iteration of the aorist ending in bold so you can see the different shades of meaning. If you can recognize these verbs and the distinctions from the closest possible alternatives, you'll be on your way to understanding this tense, although using it well will take some practice. I will note only that while this may be a vague tense that is hard for English speakers to grasp, it is a very common verbal tense that can be used in the widest variety of situations, and so you will be seeing a lot of it. Oh you huge Istanbul, I'm selling, is there no buyer? Lesson 15: Not After This will also focus on the aorist and introduce the all important conditional construction. Make sure to review the vocabulary below before moving ahead.